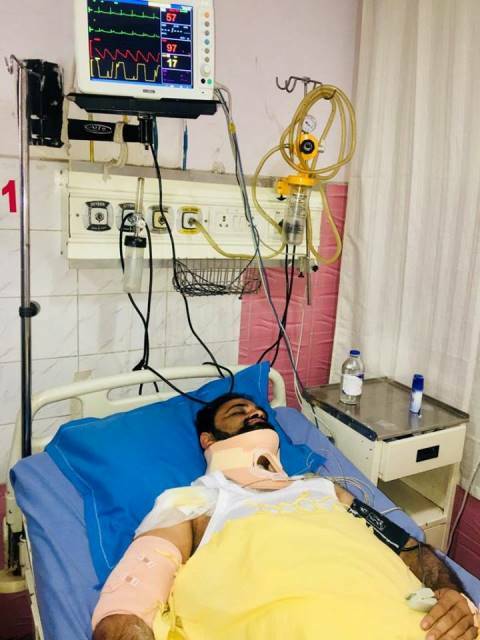 Dr Kafeel’s brother Kashif Jameel under treatment..
New Delhi: Popular Front of India has strongly condemned the gruesome attempt at the life of Kashif Jameel who is the younger brother of Dr. Kafeel Khan at Gorakhpur. Though the identity of the assailants is yet to be found, the incident points to larger law and order problems prevailing in the state after Yogi Adityanath government assumed power in the state. In a statement, Front chairman E Abubacker said that It is well known that U.P. government is angry with Dr. Khafeel Khan since the deaths of 63 babies at BRD Medical College in Gorakhpur, due to lack of oxygen. Despite the fact that Dr. Khan did his best to save lives, he was made a scapegoat for the systemic failures of the government and was sent behind bars for six months. The shooting at his brother shows that whoever is angry with Dr. Kafeel Khan has not stopped targeting him and his family. This is a highly intimidating situation in terms of security, especially for minorities and whoever the government finds unfavorable to their interests. All peace loving people of the state should come out against this deepening lawlessness and insecurity. E Abubacker demanded judicial intervention in the killing spree in U. P. against political opponents with the support of police and goons. Meanwhile, Sangh Parivar goons continue to target minorities in various parts of the country. In a recent incident, Maulana Azharul Islam and his brother Maulana Imran were brutally attacked by a mob while they were returning from after late-night prayer in Agdu village of Ratu in Jharkhand. E Abubacker stated that the studied silence on the part of Prime Minister and his cabinet colleagues amounts to approving the criminalization of state machinery by the governments in different BJP ruled states.